Qualcomm introduced Quickcharge 3.0 last week and went into detail about what it actually does. If you have ever wondered what Quickcharge 1-3 do under the hood, SemiAccurate can help. The idea is simple enough, as batteries in phones and mobile devices grow in size it takes longer to charge them. USB2 can only supply a little current and USB3 ups things a little. USB-PD can get you the required wattage, up to 100W, but it is ill-suited for mobile use for a number of reasons. The last problem is that these technologies just deliver energy, none of them cover how that energy affects the battery. Delivering a lot of energy in a short period of time is all fine and dandy but it produces a lot of heat when doing so which is also known as waste energy. That heat can both slow down the rate at which batteries charge and adversely affect the life of the cells being charged. Having technology that charges things quickly, keeps it cool while doing so, and minimizes damage to the cells during charging is the goal, and that is what Qualcomm’s Quickcharge does. The idea started out with Quickcharge 1.0 which didn’t do much for actually speeding up the charging, it was more of a battery protection mechanism. If you pump more wattage across the wire, especially if the wire or device can’t handle the power, hilarity can ensue. By hilarity I mean cooked batteries, burnt cables, and smoke, all of which most users deem sub-optimal. If you looks at what Quickcharge 1.0 brings to the table, it mainly identifies what a power source can deliver, what a device can take, and effectively caps out the current delivery at the maximum usable rate. This may seem to be a no-brainer but before QC1.0 that didn’t happen, power was just pushed out with little regard to its effects. With QC1.0 the device can be charged at the maximum safe rate rather than a lower rate that is safe for all devices. This is helpful but not a game changer. Quickcharge 2.0 is much more like what people consider to be quick charging with a claimed 1.5x charge speed over normal USB with QC1.0. There are two main technologies added with QC2.0, HVDCP and parallel charging. Parallel charging is just what it sounds like, you put two chargers in the device and they both deliver energy to the battery. For a given rate of charge that means each would deliver half the current that a single chip would and both would run significantly cooler. Cooler is more efficient and also translates into a lower skin temperature. If you are charging at 1.5x the rate of QC1.0, each parallel charger would only be passing 75% of the energy that a single chip would and again things would be cooler, more efficient, and net faster. HVDCP is a little more interesting, it stands for High Voltage Downstream Charge Port and allows higher voltages to be passed over the USB cable. With HVDCP a QC2.0 charger can send the standard 5v or ramp things up to 9v or 12v if needed. This of course requires the device to negotiate with the charger to request this higher voltage but the result can mean much higher wattages delivered vs vanilla USB sans -PD. Unlike USB-PD, QC2.0 and HVDCP doesn’t require an authentication chip in the cable itself, it just pumps more juice across the wire as long as both ends agree that they can take it. One thing SemiAccurate forgot to ask about is how HVDCP calculates if the cable can pass the current without causing the aforementioned sub-optimal whoopsies mentioned above. If you have ever plugged a cheap cable into a QC2.0 adapter and device, you can clearly see that there is some testing going on because the pairing correctly keeps the voltage low and most devices display a, “slow charging” error message. The author speculates that the actual mechanism is an analog test of the cable similar to those proposed in the early days of USB-PD before the authentication chip was ratified. However it works just remember that there is some smarts behind QC2.0 to keeps the added power from doing unsociable things. Moving on to the latest iteration of Quickcharge, version 3.0 adds quite a bit of new goodies. We will skip the parts with a plus after them, they are just newer versions of the tech described above but INOV and Battery Saver Technologies are new and quite useful. Together they make charging not only faster but also safer for the battery and do it at almost no added cost over QC2.0. It may not be perfect yet but it is once again a big step forward in efficiency, speed, and temperature. INOV stands for Intelligent Negotiation for Optimum Voltage and is the successor to the 5/9/12v scheme of HVDCP. It still works over the same USB wires aka ports from HVDCP but INOV adds much more granularity to the scheme. This new iteration can vary the voltage from 3.6 to 20v in steps of 200mV as required but the device. It also allows for up to 3A of current for a total of between 10 and 60W delivered to the device. Battery Saver Technologies (BST) are a bit more murky in their operation probably because it is more toward what most consider to be ‘secret sauce’. What it does is to determine the highest deliverable current the battery can take without damaging it, and do so on the fly. This allows charging to go on at the peak rate the battery can take, those 200mV steps come in handy here, without unduly taking life out of the cells. While any charging will degrade a cell, with INOV and BST the old days of killing a battery after a few dozen quick charges are hopefully over. In theory QC3.0, if fully implemented, can charge a battery at a claimed “>2x” rate of plain USB while still working over standard USB cables. Since QC3.0 can deliver 60W you can see that Qualcomm is being quite conservative with their claims here, if the adapter can deliver, the device can accept it, and the cells are capable, things should go a lot faster than 2x the old way. As you can see below, even these conservative numbers are high enough to be a very good thing for users. That brings us to some non-technical bits about Quickcharge starting with who can use it. Since QC2.0 is open and royalty free, anyone can implement it. There is a certification process that does cost money to go through but this is pretty minimal, certified power delivery devices are a good thing in our eyes. From there anyone can implement the QC technologies and many already have, almost any device with a big battery has it now. Some vendors call their version different names but under the hood they should all be compatible. 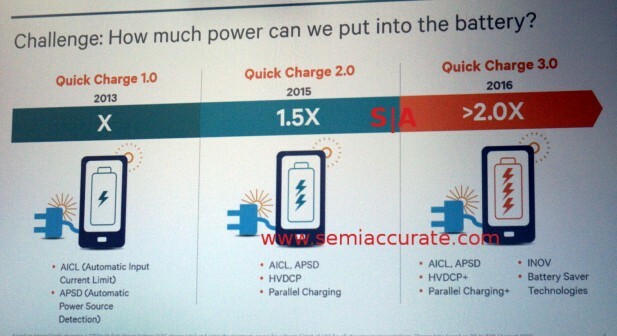 Qualcomm of course makes SoCs and PMICs with Quickcharge features built-in but also sell a standalone charging chip. This can be used to implement parallel charging or to put in a non-Qualcomm SoC bearing device. If you look at the uptake of QC2.0 in devices it is pretty clear this plan has worked out well, almost everyone in the mobile space provides it in at least some of their devices. At the moment Qualcomm lists On Semiconductor, ST Microelectronics, Etron Technologies, Power Integrations, Dialog Semiconductor, NXP Semiconductor, VIA Labs, and others as having Quickcharge 3.0 silicon. Some of these are available now, others will be out soon, but there are no QC3.0 devices on the market yet. Ironically there is actually a QC3.0 charger on the market already from Verus Peripheral, a slick little 20W world charger with full QC3.0 capabilities. Sadly Qualcomm would not give us a pre-release 820 reference platform to test our shiny new charger with although we did ask. That brings us to the next part, devices. There are three SoCs from Qualcomm with Quickcharge 3.0 built in, the Snapdragon 617, 618, and 820, none of which are out at the moment. You can also add in a SMB1350/13501 charger for parallel charging with a plus if you pair it with a QC3.0 device. By the time any of these devices are out, the QC3.0 infrastructure should be there to support it, SemiAccurate already has one charger in-house. The last piece of the puzzle is cost which as we mentioned above should only be a minor increase over QC2.0 chargers. Most people may be skeptical of this given the price increase of QC2.0 devices over QC1.0 or vanilla USB chargers but there is a good reason for the increase and it is not conspiracy laden certification fees or the like. QC2.0 raised the wattage limit for charging quite a bit over standard USB and higher wattage chargers cost more than lower wattage ones. There was some silicon cost on top of all this but that is a minor addition compared to doubling or more of the charger wattage. That is where most of the QC2.0 cost adder comes from, more electronics not silicon or fees. If you compare a QC3.0 device to a QC2.0 one at the same wattage levels the main differences are the voltage negotiation granularity and speed, something that will cost cents worth of silicon to implement. Qualcomm claims only a minor increase in the BoM for a QC3.0 device and we believe that claim, when silicon volume ramps it should be roughly zero.